After a week of disappointing showings from all NFC South teams not named the Panthers, the division race is all but finished. However, in the increasingly muddled NFC Wild Card race, all the other teams are still alive. In fact, the Falcons are still very much in the running, although it might not feel like it. The Buccaneers also sit right behind them in the Wild Card standings, despite their poor showing this week. The Saints have an outside shot too, but fans and the front office are probably already thinking about next season. The Falcons slide continued, as they have seemingly forgot how to play offense. I thought the Falcons would be bad this year, but figured the problem would be their defense, not the offense. The score was close, until Adrian Peterson broke a 35 yard run with about 4 minutes left in the 4th quarter. However, the Falcons never got anything going on offense, and it’s tough to win that way. The team, again, also added a few costly errors. Matt Ryan threw two picks, one in the end zone, after a 1-yard touchdown by Coleman was called back on a penalty. Coleman, although high on potential, also fumbled on the longest run of his career, a 46-yarder. That’s the kind of thing that will force a running back to the bench fast. At least, Freeman will likely be back next week, and may be able to get the offense back on track. The Falcons have failed to do anything on offense since early in the season. Matt Ryan’s poor play, and lack of weapons has turned this once explosive offense into a dud. If they don’t get back on track immediately they are in danger of being one of the few NFL teams in history to start 5-0 and fail to make the playoffs. I don’t see them putting things together in time, and their schedule is not favorable as they play Carolina twice in their last five games. 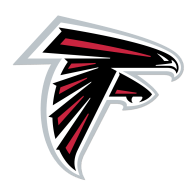 Fantasy Implications – Tevin Coleman played well, other than the fumble. Unfortunately, this is a recurring problem for him, and he needs to figure it out quickly. 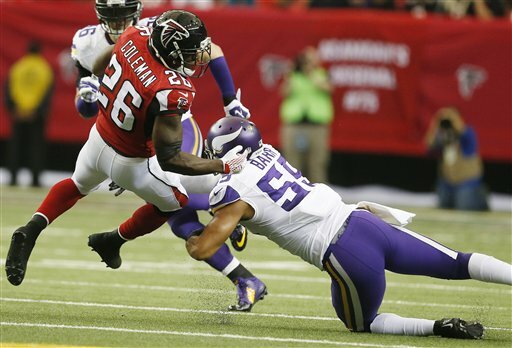 Devonta Freeman should be back next week, perhaps making it a moot point in the short term. Julio Jones has also been rather disappointing, a common theme among Falcons players. After a huge start, in which I predicted a monster season, he has not played like a WR1. His talent is nearly unmatchable though, so I’d probably continue starting him. Depending on how deep your team is though, I’d at least think about sitting him when they face the Panthers in a couple weeks. I wouldn’t give Matt Ryan the same leniency. I doubt many people are still starting him, and I wouldn’t continue to do so. He’s no more than a QB2 this season, until the Falcons show they can put together some offense. Surprisingly, there were a large amount of people that picked the Cowboys against the Carolina Panthers. 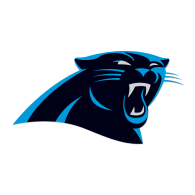 Surely, the Cowboys were better than their 3-7 record, especially with a seemingly healthy Romo, but the Panthers are undefeated and unstoppable. While the offense didn’t play very well, they still blew the Cowboys out thanks to their incredible defense. They got off to a great start as Kurt Coleman had a pick-6 in the first minute of the game. Luke Kuechly showed why he’s the best linebacker, and probably the best defensive player, in the NFL. 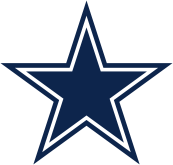 He single-handedly broke the Cowboys’ back in the second quarter by running back an interception for a touchdown, and then on the next play of the game, adding another fantastic interception. The defense dominated the rest of the game, and it didn’t matter that the Panthers only had one offensive touchdown. Luke Kuechly intercepting Tony Romo. The Panthers have all but locked up a playoff spot and should also have home field advantage throughout the playoffs. 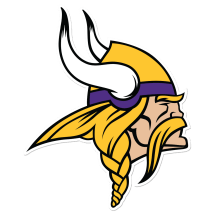 They can beat you with either their defense or offense, and are arguably the closest thing to a complete team in the NFL. No, their schedule hasn’t been especially tough, but going 11-0 is no fluke. Cam is a dynamic force, playing behind a solid line. Stewart has played really well as the season has gone on. They have one of the best tight ends in the game, and capable wide receivers (their biggest weakness). Now, take a look around the defense. It’s littered with stars at every position. Fantasy Implications – Not much has changed for this team. They had a bad offensive game, but should be back on track next week against a terrible Saints defense. Obviously, keep starting Cam, Stewart, and Olsen. Funchess had a down game, but should continue to trend upwards. He’s worth a roster spot, and I like him as a flex against the Saints porous secondary. But, it’s hard to tell how any Carolina wide receiver will play from week to week. 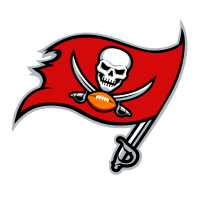 The Bucs had been getting better as the season wore on, and were actually looking as though they might gain a Wild Card spot. That can still happen, but their chances took a hit against the Colts. The Bucs didn’t play well in most facets of the game. However, they kept the game from getting out of hand, by bending and not breaking. They only forced 2 punts until the last 5 minutes of the game, and were shut out in the second half. Winston threw one touchdown and one interception, completing 20 of 36 passes for 245 yards. He was also sacked 5 times. 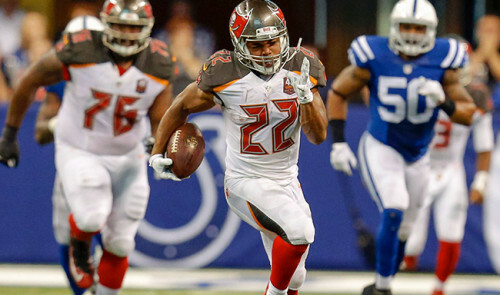 Doug Martin looked good again, breaking off a 56 yard run to set up their only touchdown. The Bucs showed that they still have work to do. I don’t see them making the playoffs, because of their youth and weaknesses, but you might as well look to a groundhog or your local fortune teller when trying to predict this year’s NFC. Winston has shown tremendous progress, despite his down week. It wasn’t an atrocious game by him, just poor. He’s exceeded my expectations already, and if he continues to play well, they could definitely sneak into the postseason. However, they’re going to need better production from their offensive line, and defense. Fantasy Implications – After putting together some really good performances, Winston struggled. He’s still an option though, if you need a quarterback. Mike Evans, dropped a touchdown pass, but is still a good bet going forward. Vincent Jackson is also doing well. 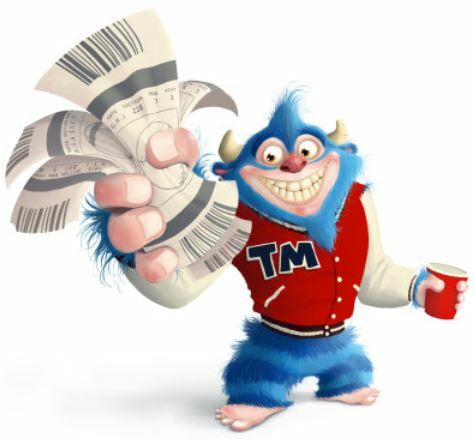 He’s not great, but is a decent flex option. He consistently puts up 60-80 yards and has a decent chance for a touchdown. Meanwhile, Doug Martin continued his terrific season, passing the 1000 yard mark. The Saints played terribly, and have little chance of making the playoffs now. They were unable to score a touchdown for the first time since 2005, and managed only a couple of field goals. Drew Brees sacked by J.J. Watt. Of course, they were playing against a Texans team that has been on fire. Watt had 7 QB hits, and 2 sacks. It’s not hard to see why the Saints struggled. 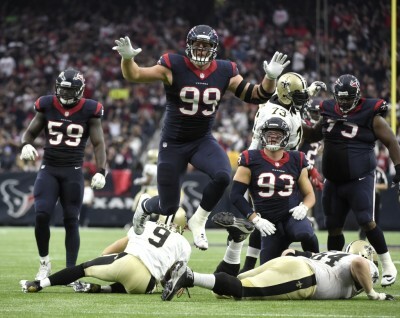 The Texans scored early, and then allowed their defense to dictate the rest of the game. This is a good recipe for them, since the defense has turned it around since the beginning of the year. Despite an NFC where everyone seems to be in the mix, I can’t see the Saints having another hot streak and making the playoffs. The Saints probably never really had a chance with their terrible defense. 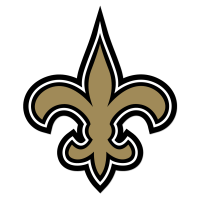 Fantasy Implications – Despite a rough game against the Texans, there are still a few valuable fantasy assets on the Saints. Don’t be fooled by their awful play against a top defense. Brees is still a playable QB with good potential. However, Brees is clearly not the quarterback from last year, whether that’s due to injuries or a lack of weapons, I’m not sure. Ingram still averaged 5.8 yards per carry, but only had 9 carries, because they played from behind the whole game. Ben Watson also had 53 yards, which is decent against the Texans. Brandin Cooks had only 35 yards, but also had 8 targets. He’s had a rough season, but is still a flex option with some potential.